Soracam: a drone that chases you wherever you go with a GoPro Hero3+ Black camera. 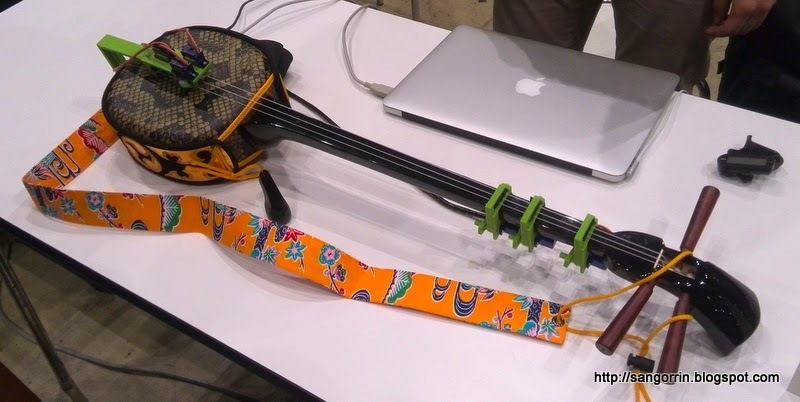 A shamisen instrument played by servo motors. The music notation for shamisen was based on Kanji characters!. Motors: normal DC motors with a variable resistor for feedback (normally you would use steppers), and a servo motor for the head. The DC motors are connected to a gear box that you can buy in a robot store near Ishikawa neji in Akihabara. PCB pick and place: this is a typical CNC but with a small air pump (not a vacuum pump because it would be difficult to release the parts). Elevators to the space: I was told that about 23 teams were building prototypes of elevators (クライマー) to the space. They put together some money (I think 100,000yen/person or so) and bought a balloon which was released near Fuji-san up to 1200m (they said that if it was until the space it would take around 1 week to arrive). The balloon is connected to the ground through a carbon-nanotube cable (テザー). Their next goal is to reach 2400m. Incredible marble machines made of wood, brass wire and a bit of magic. Aquamodelers (see also here): a group of fans of submarine drones. They rent a pool together every month to try out their submarines. The guy made this start trek-like submarine using different techniques. He started designing it in a 3D modelling program. Parts with curves where done by sculpting foamed styrol (発砲スチロール), creating a mold of plaster (石膏型) and using Polyester resine and Fiberglass (FRP). A LED lamp connected to multiple optical fibers for giving the effect of millions of small lights. The submarine has a RC receiver (controlled from outside the pool) and uses water pumps to pilot the submarine. He used a Siphon pump (石油 ポンプ) and changed its motor. Hydroforming: a guy explained me how he created his version of a famous star wars robot using aluminum. I learned of a nice technique, called hydroforming, for creating rounded shapes on metals such as aluminum. 2525 power generation: they created a rotating table using wood and a flowerpot. Then they attached 4 bicycle 3W dynamos and then rectify them using 4 schottky diodes. The output (0~2.5V) was connected to two 50F capacitors and 2 DC-DC converters that output 5V to a controller that manages a camera and 5 LEDs. 3DVR: a nice set of stereo googles made of 100yen shop components: for each eye you glue together 3 magnifying glasses, and then put the result inside some protection googles to keep them together. Then you install an application in your phone such as DiveCityCoaster or Taovisor, and you can see stuff in 3D. 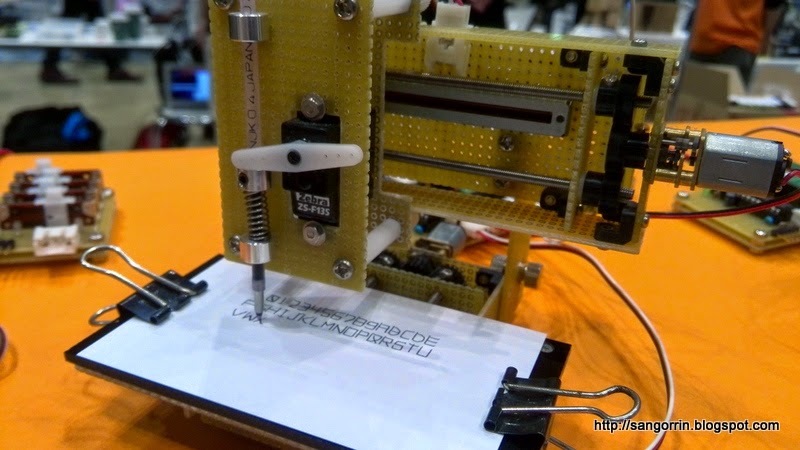 Podea: this is a small factor laser cutter. What I learned was that you can convert any black and white picture into a dotted picture using GIMP (convert image to 2bit black and white using the Floyd-Steinberg algorithm). Then you can easily use your laser cutter to print in grayscale (search 点画 in Japanese). 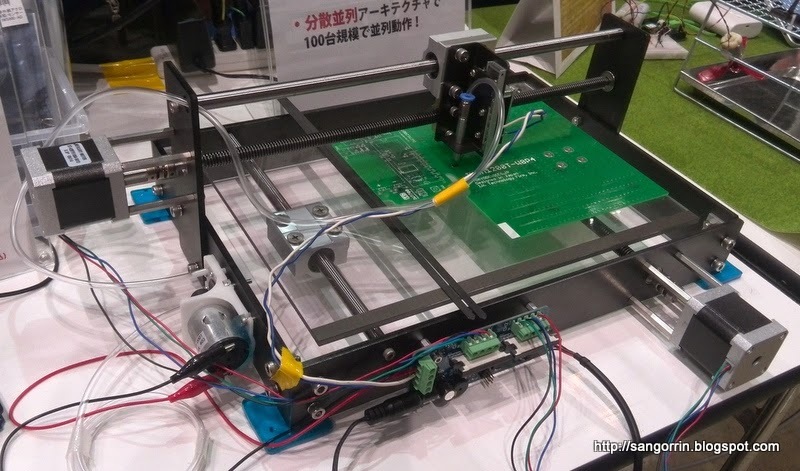 i.materialise: an on-line 3D printing company in Japan. They told me that printing in PA (polyamid) was cheaper than other companies. They many other materials as well including ceramic, silver, gold.. Other on-line companies I know are shapeways, rinkak, DMM. 3D printing contest: the entry deadline is Jan 19th, 2015. Makeblock: an open source robot construction platform.